Kit out your kitchen with a cool stone surface that’ll band together beautifully with some on-trend extras. ABOVE SURFACES Caesarstone in Bianco Drift (backdrop), Statuario Nuvo (large rectangle), Sleek Concrete (small rectangle) and Atlantic Salt (small square), caesarstone.co.nz. OBJECTS, FROM BOTTOM LEFT Marble bowl, $30; condiment spoon, $17; cheese knife, $25, cittadesign.com. Icon Kitchen Gooseneck mixer by Astra Walker, $799, thekitchenhub.co.nz. Brass Contour keyring by Karl Zahn for Areaware, $39, everyday-needs.com. Marble bowl, $17, cittadesign.com. Amola bacon salt, $12, cookandnelson.com. Stoneware plate by Wundaire, $36; Stonewashed linen napkin by Vida, $23, tessuti.co.nz. Earth bowl by Robert Gordon, $59, fatherrabbit.com. Cane bowl stylist’s own. ABOVE SURFACES Caesarstone in Vanilla Noir (backdrop), Piatra Grey (small rectangle), Jet Black (dark square) and Wild Rocks (flecked square), caesarstone.co.nz. OBJECTS, FROM bottom LEFT Fruit bowl by Walk in the Park, $200, muck.co.nz. MK02 Meir Traditional Kitchen mixer, $459, thekitchenhub.co.nz. Dish brush, $35, everyday-needs.com. Bowl by La Chamba, $25, tessuti.co.nz. Plate and napkin stylist’s own. 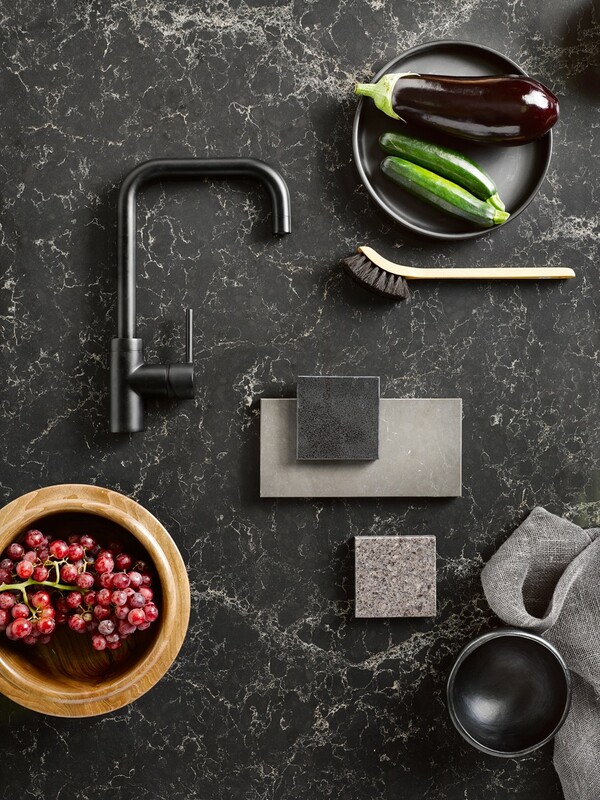 Caesarstone manufactures high-quality, premium quartz surfaces. Applications in residential and commercial interiors include kitchen bench tops, splashbacks, bathroom vanities, wall paneling, furniture and more. A global leader and pioneer in its field, Caesarstone prides itself on its ongoing commitment to research & development, innovation and the highest quality standards. The exceptional beauty, strength and durability of quartz ensures a product that is far superior to natural stone and other manufactured surfaces. 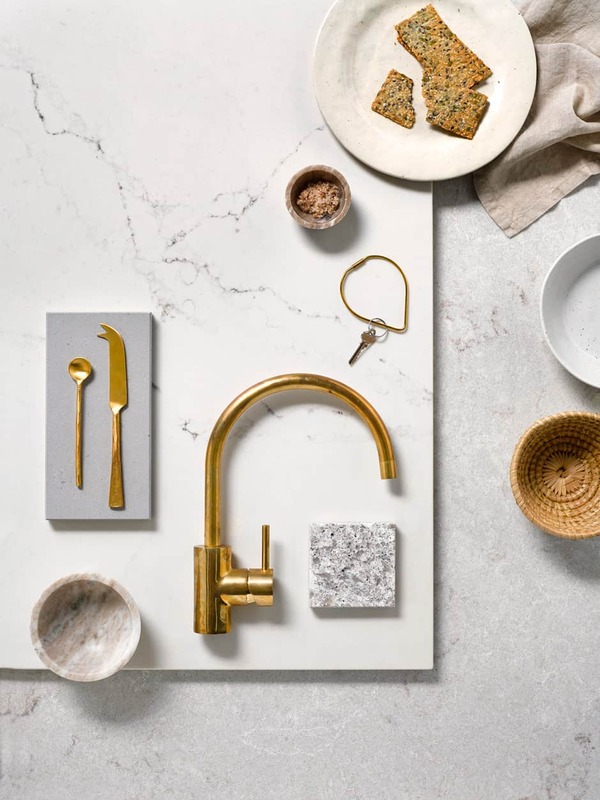 Created from 93% natural quartz aggregates, organic pigments and enhanced polymer resins, Caesarstone provides a surface with exceptional properties of heat, stain, scratch and chip resistance. Caesarstone is made from natural quartz and therefore some variation in colour and aggregate can be expected on slabs. Caeasarstone – New Zealand’s leading brand of quartz surfaces.